Cocept 2001 takes modularity all the way. Flexible, compact, elegant and light. That's how your office shapes up with Concept 2001. Concept 2001 energizes your routine with a corner layout that contrasts our Dark chocolate and Willow grey with Silver accents. Thick 1-inch edges on work surfaces provide a quality finished look. The feeling is light and spacious and the functionality is complete. 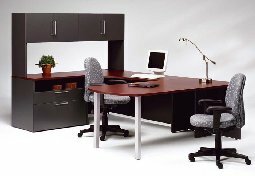 Define your workspace or move around freely as needed, all without overextending your resources. 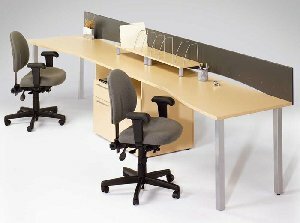 With many occasional furniture modules on casters, Concept 2001 has the agile options that work on their own or integrate with other styles. 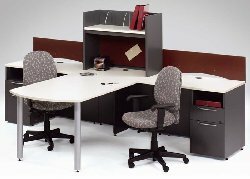 Corner a space for one or double up on efficiency with side-to-side or back-to-vack workspace configurations, just a few of the endless options available with Concept 2001. Work surfaces are pre-drilled for privacy screens, modesty panels, pedestals or legs to make adding or moving them easy. Go for it with a triple dose of color in extended corner modules with privacy screens and modesty panels. 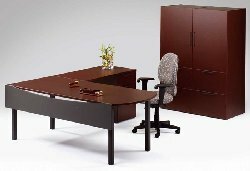 Add mobile pedestals and pigeonholes, shelves with wire dividers, tackboards and a choice of handles and legs to organize and personalize your space. Concept 2001 has storage to spare, work surfaces generous enough to share and practical details designed with care. A D-shaped surface with an extended corner module, hutch and lateral file create a classic U layout. 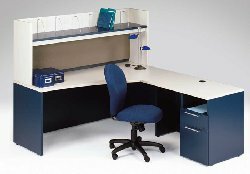 Surface and desk modules arranged in an L-shape and storage cabinets with lateral file drawers for an open look. And T for two is served up with privacy screens and a wire divider shelf. Cabinet doors and drawers that lock add security and a choice of handles and table leg styles allow freedom of design expression. Stay focused on efficiency but still get all the features you need and the look you want. In office settings for one, two or more, inspired color combinations jazzed up with Silver accents, satisfy the most style-conscious standards. Choose from a wide selection of wood grains, solid colors and patterns in a one or two-tone finish. Open spaces and closed storage, components on wheels, a practical pigeonhole shelf, a choice of handles are just some of Concept 2001's ingenious details. Roomy or compact, open or closed, permanent or mobile, Concept 2001 has whatever component you need to complete your office's smart looks and functionality. 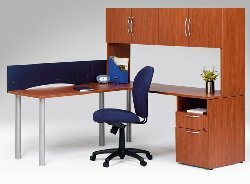 Optional 1/2 height modesty panels, choice of handles and legs are features you'll appreciate. 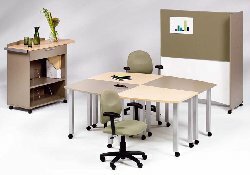 Bookcases, tables, boards with accessory trays and utility carts for all your electronics with sliding shelves and wire dividers - everything for the office that's going places. Concept 2001 gets things rolling with purpose-designed modules on wheels in a choice of shapes and colors. Pick your favorite color combination, like ginger and clay with Silver accents, and mobilize it in every direction. Computer and CPU stands, EDP tables, storage modules and mix and match table components work seperately and togeather. Note our ingenious utility unit with optional handle and flip extension surface, wire grommet, drawer and shelf dividers.